The Rural Farm Sheds manufactured by Trusteel Fabrications are designed with a "built to last" mentality from hobby to large commercial farms. The Trusteel rural farm sheds are made from steel with frames utilising "C" section columns and rafters. A feature of the Trusteel design is the 6mm thick centre connection plate that provides great strength to the frame. The frame is further bolstered utilising 16mm nuts and bolts for all connections along with a "C" section fascia purlin for stability. 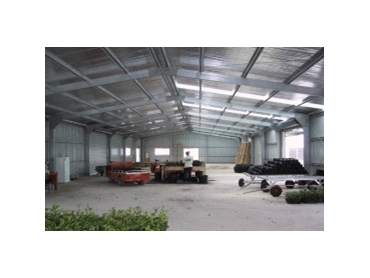 The standard eave heights of these rural farm sheds range from 3.0m to 4.2m in height. Utilising sliding doors will achieve door height clearance of no less than 250mm below eave height. For domestic and rural farm sheds Trusteel uses 3.0m or 3.6m bays, however 12m wide design incorporating 4.5m bays are also available. A standard roof pitch of 10 or 12 degrees apply for a gable roof.